Šempeter is a compact settlement on the edge of the Žalec town in the heart of the Savinja Valley. It counts about 2000 inhabitants. It is an urbanized settlement and has a small extent of the mechanical and chemical industry. The Savinja river flows through the locality which at the beginning of our count was flowing just under the settlement, later was moved the stream almost 2 km away. 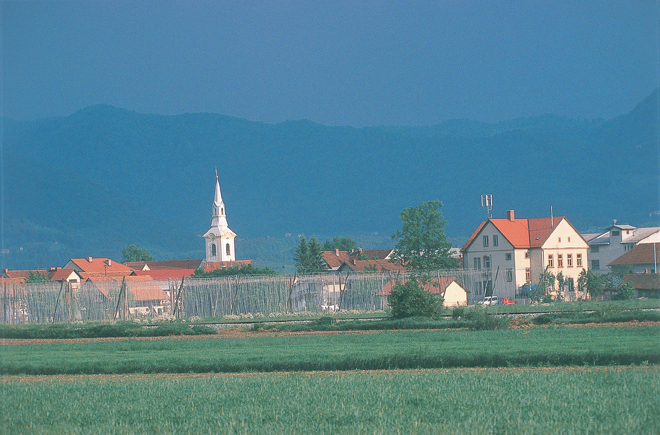 The Savinian village is connected with the regional road Celje-Ljubljana. An important Roman road between Emona and Celeia was taken place here already in the ancient Roman times. Today,across the local community railway connection takes place between Velenje wich is the mining and industrial center and the largest town in the Savinja Valley – Celje. The highway wich connect northwestern and south-west Slovenia is probably the most important traffic connection. Already in the Bronze Age, the amber route from the Baltic to Italy led the way through the valley. Later, the Roman road whose remains are still be seen today on the east side of the village led the way through Šempeter. There is a preserved Roman road, on which the outlines of tombs and smaller graves are restored. In the center of Šempeter is the Roman Necropolis archaeological park, in which are visible the most beautiful Roman tombs in Slovenia. The Romans are in the habit of burying of the dead people along the roads outside the fortified cities. The tombs in Šempeter represent the remains of the Celea town elite. The cemetery was accidentally discovered in the year 1952 while digging of the gravel. Part of the cemetery is about the year 266 after our count undermined of Savinja and then the river covered the tombs and gravestones with the sand. The first excavations took place in the years 1952-1956. The excavations were completed in the years 1964-1967. After the excavations were completed, over 100 tombs of families whose members performed important offices in the near Celea, and over 600 archaeologically important objects were listed. The most impressive tombs were chiseled out of the Pohorje marble. The largest tomb is the monument of the Spectacle’s family and is 8.25 m high. Church of St. Peter was reconstructed in the second half of the 18th century to Baroque style. Especially precious is the statue of Virgin Mary from the beginning of the 14th century. The Brollo ’s frescoes are painted in the church. In the past, furmans also played an important role in the development of transport. This activity was mainly dealt with by farmers. Šempeter served as a kind of resting- place, as they changed horses at the inns and at the post- building and they took a refreshment for further travel. The building of the old post office is still preserved. As everywhere else, the school was also established in Šempeter. The beginnings of lessons go back to the end of the 18th century, when Maria Theresa introduced reforms. The oldest school building was built in 1818. The school stood north of the church on the main road and was one-storey house. At that time, there were not many school-age children, so that was enough. In the winter it was very humid in the classroom. Soon the school was expanded by another classroom, as the number of children increased. The lesson started at 9 am and lasted until 12 am, then in the afternoon continued from 1 pm to 4 pm. One school hour lasted as much as 60 min. The beginnings of local self-government in Šempeter go back to the middle of the 19th century, when it first becomes an independent administrative unit as a municipality, with the then name Sveti Peter ob Savinji. It included the following places: Dobrteša vas, Sv. Peter, Spodnje Roje, Zgornje Roje, Podlog, Zalog, Spodnje Grušovlje and Zgornje Grušovlje. In 1941 the municipality of Sv. Peter was abolished, The municipality was abolished when it was joined by the German occupier to the municipality of Žalec.